(4 p.m. EDT) -- As part of The Norwegian Edge investment program, Norwegian Cruise Line will be closing its private island, Great Stirrup Cay, for refurbishment. 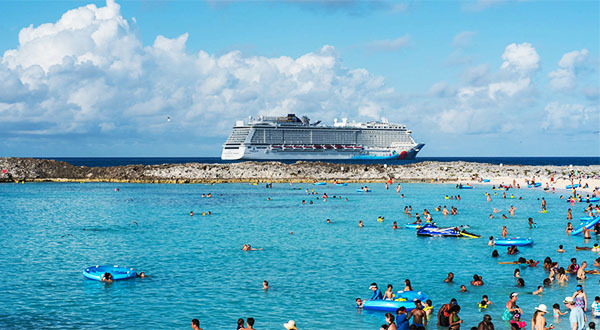 The closure will take place from August 25 to October 20, mostly affecting short itineraries on Norwegian Sky, which will sail to Nassau and Grand Bahama instead. As reported earlier, upgrades to Great Stirrup Cay will include $1 million in new landscaping; 100,000 square feet of new pathways, including a new boardwalk along the beach; the addition of two zip lines; an underwater sculpture garden; new shaded areas and rest stops; a complex with basketball and volleyball courts, as well as a stage for entertainment; more dining options, including a free taco bar and LandShark Bar & Grill, an a la carte Jimmy Buffet restaurant; and a Lagoon Retreat area with a spa, restaurant and rented villas for passengers staying in the Haven and Suites. "We look forward to welcoming our guests back to the upgraded Great Stirrup Cay this winter, and to experience the new Lagoon luxury villas next summer," the line noted in a release.